Apple created this problem for themselves. In September 2017, they upended years of iPhone naming conventions to release the iPhones 8 and X (pronounced ten). This instantly created questions about the names for this year’s phones. Would they release an iPhone 9 a year later? Now that we think we know what the 2018 models will look like, we have to ask even more complicated questions and re-evaluate a lot of outdated assumptions. This phone will be a direct successor to last year’s iPhone X. It has an Organic Light-Emitting-Diode (OLED) display, no home button and two vertically arrayed cameras. Traditionally, based on the tick-tock cycle of iPhone names this would be called the iPhone Xs. However, the iPhone 8 didn’t get an “s” generation so I wouldn’t be surprised if that tradition went the way of the Newton. This phone has a significantly larger footprint, but is otherwise the same as the 5.8″. In years past this would have been called a “plus,” due to its larger size (i.e. iPhone 8 plus). This is the curveball. Clocking in at a 6.1″ diagonal it is somewhere between the other two phones in physical size. It uses a Liquid-Crystal Display like the ones in all iPhones 8 and earlier. This phone also only has one camera lens, placed in an extruding bump similar to the one on the iPhone 8. Based on the case specifications and the significantly cheaper display panel, many analysts are expecting this phone to be priced way below the other two. In the past, there have only been two low-priced ‘new’ iPhones: the SE and the 5c. The SE was thought to be a concession to users who didn’t want the larger sizes of the iPhone 6 generation. The 5c was a commercially unsuccessful budget phone made out of cheaper components. How could Apple name these iPhones? There are a few different iPhone naming schemes Apple could introduce this year. Almost all of them will create confusion for the lay-consumer. And whatever they decide will dictate the branding of the world’s best-selling phone for years to come. I would argue that the average consumer’s expectations of the device are tied to the number. In the past Apple has kept older, lower-numbered, phones in the lineup and discounted them as a budget solution. For example, at the time of this writing the iPhone 8 starts at $699 while the iPhone 7 starts at $549. This has been Apple’s solution to the “low-end” of the market for almost a decade. And while this does saddle budget buyers with outdated tech, it creates a consistent nomenclature. The average Apple Store visitor can easily tell the price difference between iPhones 6 and 7. They can also see the number of additional bullet points under the “tech specs” and gather that the 7 is faster, newer and better despite looking nearly the same. I, like many analysts, would appreciate a respite from the numbers. The rest of the market may not be ready though. The new LCD phone will probably cost more than the iPhone 8 currently does on its release day. Naming it the iPhone 9 allows Apple to keep the same name/pricing model on the middle-to-low-end devices. However, the lack of substantial changes to the 5.8″ OLED would suggest that it isn’t “deserving” of a new number. This phone could become the iPhone Xs (ten-s), much to the chagrin of some commentators. iPhone naming isn’t about pleasing the pros though. At the end of the day, Apple’s goal should be to use a system of names that anyone can understand. With that in mind, I expect to see a lot of numbers next week. Everyone, in every country, can at least understand that 9 is better than 8. This Tuesday Apple held their semi-annual iPhone event during which they announced the latest in their line of immensely popular smartphones. The computing giant announced two models this year (as opposed to their traditional one per event); the feature-heavy iPhone 5s and the ‘budget-priced’ iPhone 5c. During the announcement they flaunted the 5s as their most “forward-thinking” phone yet, a title being picked up by all sorts of tech blogs that is quite accurate considering the company’s previous releases. What fewer people are discussing is how the 5s is thinking ahead of others in the field, and how game changing the announcement of the 5c is. So, how is a device released by one of the largest and longest-running smartphone manufacturers any more forward-thinking than their six previous devices? For the first time, Apple is releasing a device with features that aren’t available anywhere else on the market yet. The iPhone 5s, with it’s new Apple A7 processor will be the world’s first 64-bit smartphone. For those who don’t speak tech, this means that it will be able to run highly intensive apps that other phones won’t and it will run faster and harder in the paint than a traditional 32-bit smartphone like the iPhone 5 and previous models. While this high intensity processor is sure to cause a massive drain on battery life, it’s the sort of thing that makes techies salivate and wait in line even earlier in anticipation of release day. The 5s also has a built-in motion sensor, which may not seem like a huge deal, until you consider the app they’re developing with Nike (Nike + Move) that is set to track users’ fitness, sleep and other habits through said sensor for healthier living. Now, you’re probably thinking that this isn’t all that big of a deal since devices like the FitBit and the Jawbone Up already serve these purposes. That’s just the thing though, with the 5s you won’t need to wear a clip on peripheral or a bracelet. The same functionality is packed into a device you already carry everywhere anyway. I fully expect this functionality to be phased into all smartphones and put companies like FitBit completely out of business. Beyond that there are huge improvements in the camera including a dual-tone flash designed to give off a more natural light and a built-in slow-motion video capture mode. These features as well as the purported slight improvement in battery life, are about what we expected and are the sorts of things most phone manufacturers add when they upgrade. However, Apple did take a recent smartphone functionality trend and push it to a new level this time around, which is somewhat out of their character as well. A number of Android devices released recently have included fingerprint scanners for security purposes, but with the iPhone 5s users can tie their fingerprint to their App Store account. Meaning that their unique fingerprint is required for purchases made from their phone. This kind of password-free security could be what it takes to make apps like Passbook and Google Wallet actually appealing to the general public for the first time. The combination of uniquely innovative features and brand-new applications for new(ish) hardware features definitely supports Apple’s claim that the iPhone 5s is their “most forward-thinking” phone. This not only increases the buzz for the upcoming device’s release, but sets a powerful precedent for all future iPhone reveals. For the longest time Apple stated they had no intention of developing a cheaper iPhone marketed at a budget demographic. I can’t help but think that the reasoning behind this was the fact that iPhones are quite the status symbol in America. Owning an iPhone over any number of Android devices carries a connotation of higher social influence, affluence and/or technological awareness depending on the individual and various other factors. A close non-tech industry friend of mine from high school tweeted after the announcement that she thought the iPhone 5c looked tacky and that she would probably judge the first person she saw carrying the plastic-backed iDevice. This says quite a lot about the social sway iPhones have on the smartphone market. Why then would Apple release a device that will appear tacky or second-rate? I think they’re playing the long game here and thinking internationally. At the end of August, Samsung held the highest market share of smartphones in India, one of the world’s largest countries and one with a developing economy (in comparison to the US at least). Apple didn’t even place in the top five. With a half-price iPhone, Apple could easily tap into markets in countries like India while simultaneously broadening their appeal in the United States and slowly pushing back their elitist reputation. It’s essentially a win-win. The other game-changing element to the 5c actually comes in the form of it’s bright colors and (potentially) tacky design. Look at the phones. Don’t they just jump out as the next big ticket Christmas gift? 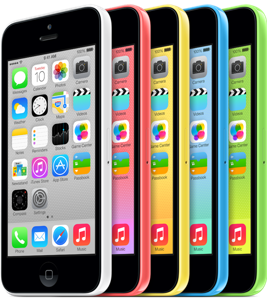 The iPhone 5c isn’t just a budget iPhone, it’s an entry level iPhone. Competitively priced with entry-to-mid-level Androids, the 5c is perfect for Johnny’s first smartphone. And I can just hear my not-so-little-anymore cousins (13 and 14) pleading with their parents to buy them pink iPhones this holiday season. Sure the 5c may seem tacky or second-rate to college students and young professionals, but their younger siblings and cousins are going to be begging for them. The iPhone 5c is dramatically widening the demographic range for the iPhone and thus exponentially increasing Apple’s potential sales. It’s honestly one of the smartest moves I’ve seen in tech all year.